Just the Job, 1st class product. For the safe cleaning and sterilising a wide range of tools, the Milton 5 Litre Hospital Pack has been used in the medical industry for many years. This disinfecting fluid is formulated from a non-hazardous chlorine based bleaching agent that effectively kills off bacteria, fungi and viruses in under 15 minutes. Suitable for use in hospitals and care homes, this large 5 litre bottle boasts a durable handle and screw down lid allowing it to be stored safely until required. 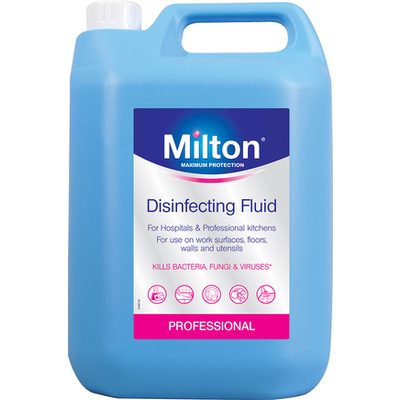 Best used for disinfecting everything including bottles, bed pans, urinals and plastic protective clothing among other items, Milton is also suitable for sanitising water before drinking or washing foods to remove pesticides or growing agents. How do I use Milton disinfecting fluid? How much disinfecting fluid do I need to add to my bucket of water? If you're looking for an alternative at a more economical price, our own branded Gompels Sterilising Fluid is just as powerful and effective at killing bacteria, viruses and other harmful substances.